From an e-mail I just received! NOTE: For most players, you do not need to do anything, as this entitlement will automatically be added to your account, but check your SOE.com account over the next week or so to make sure this is added. Enjoy your free pile of ****! great. The wealthy get freebies, while the struggling are left in the cold. Oh well, It’s not likely i’ll ever get to go. Hey Sony. I’ve paid your subscription fee’s for 7 years now, Where’s my freebie ? We have encountered a system error while processing your request. I am glad I’m getting this for free. If I had to pay for this kind of service I’d be MUCH madder than I am now . . . Gotta love the “Inspector Gadget Style” coding. Go, go, Sony programming! nice to see the North American bias again. Cant get to Fan Faire because of the distance? Tough; dont get an early beta invite and no freebies for you! I’m in Europe and went to Fan Faire. But then again I’m insane. What bias? You can Register for Fan faire just for the Free expansions And Beta access without actually going there. I know People who have done that. They are giving away the collector’s edition, too, not just the basic $40 one. …. for me $3k would have just about covered the return airfare. Add in accommodation and the cost of fan fare 5k might have covered it. Seriously, congrats to those who qualify, I’d have loved to be able to go this year myself, but the more that do the merrier. if you have the money I seriously recommend a fanfaire though, just for the events they put on its worth it alone. And if you are outside of the US just try and find an excuse to visit Las Vegas (and maybe see a bit more of the US too). For me $3k would have just about covered the return airfare. Add in accommodation and the cost of fan fare 5k might have covered it. Where are you, New Zealand? I flew to Fan Faire from Denmark via Houston. All told it was just over $3k (I eat cheap when I’m traveling alone). Question about this: The e-mail (as shown above) says, “Click on the log-in button to reserve the expansion free of charge.” Yet, since I received that e-mail, every time I click on that link to try and reserve a copy, I get an error message when trying to log-in to the web page I’m sent to from that link. 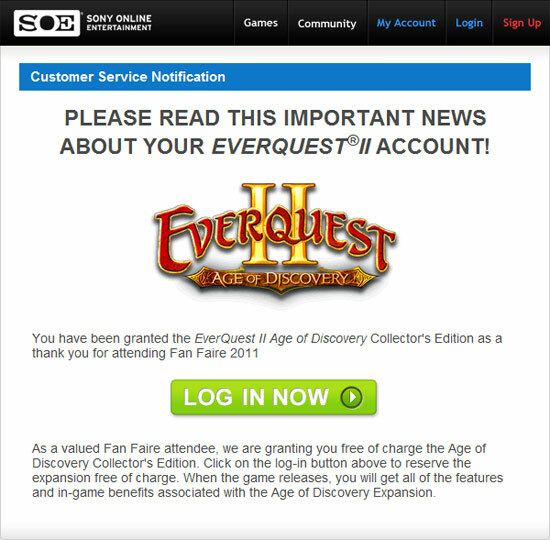 When trying to reserve a copy from the EQ2 website and not the e-mail, when I log-in the ability for me to reserve AoD, either version (standard and collector’s editions) are “grayed out” and it says ‘granted’ in the bar. So . . . do I HAVE the expansion or not? I DID attend Fan Faire, but I cannot reserve what should already be set aside for me because of an error message and i’m getting conflicting info on their site . . . /sigh Looks like I”ll have to call CS . . . again . . . . Anyone else who went to Fan Faire experiencing this?